Author: Popp, R. et al. September 11, 2001 might have been just another day if the U.S. intelligence agencies had been better equipped with information technology, according to the report of Congress’s Joint Inquiry into the events leading up to the Sept. 11 attacks. The report claims that enough relevant data was resident in existing U.S. foreign intelligence databases that had the “dots” been connected—that is, had intelligence analysts had IT at their disposal to access and analyze all of the available pertinent information—the worst foreign terrorist attack to ever occur on U.S. soil could have been exposed and stopped. In the aftermath of the Sept. 11th terrorist attack, the U.S. Defense Advanced Research Projects Agency (DARPA)—the U.S. Defense Department agency that engages in high-risk/high-payoff research for the defense department and national security community—focused and accelerated its counterterrorism thrust. 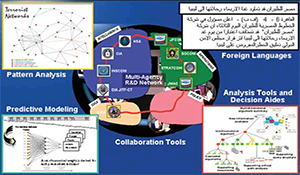 The over- arching goal was to empower users within the foreign intelligence and counterterrorism communities with IT so they could anticipate and ultimately preempt terrorist attacks by allowing them to find and share information faster, collaborate across multiple agencies in a more agile manner, connect the dots better, conduct quicker and bet- ter analyses, and enable better decision making. The world has changed dramatically since the Cold War era, when there were only two superpowers. During those years, the enemy was clear, the U.S. was well postured around a relatively long-term stable threat, and it was fairly straightforward to identify the intelligence collection targets. Today, we are faced with a new world in which change occurs very rapidly, and the enemy is asymmetric and poses a very different challenge; the most signif- icant threat today is foreign terrorists and terrorist networks whose identities and whereabouts we do not always know. What is the nature of the terrorist threat? Historically, terrorism has been a weapon of the weak characterized by the systematic use of actual or threatened physical violence, in pursuit of political objectives, against innocent civilians. Terrorist motives are to create a general climate of fear to coerce governments and the broader citizenry into ceding to the terrorist group’s political objectives. Terrorism today is transnational in scope, reach, and presence, and this is perhaps its greatest source of power. Terrorist acts are planned and perpetrated by collections of loosely organized people operating in shadowy networks that are difficult to define and identify. They move freely throughout the world, hide when nec- essary, and exploit safe harbors proffered by rogue entities. They find unpunished and oftentimes unidentifiable sponsorship and support, operate in small independent cells, strike infrequently, and utilize weapons of mass effect and the media’s response in an attempt to influence governments. There are numerous challenges to counterterrorism today. As we noted earlier, identifying terrorists and terrorist cells whose identities and whereabouts we do not always know is difficult. Equally difficult is detecting and preempting terrorists engaged in adverse actions and plots against the U.S. Terrorism is considered a low-intensity/low-density form of warfare; however, terrorist plots and activities will leave an information signature, albeit not one that is easily detected. In all cases, and as certainly has been widely reported about the Sept. 11 plot, terrorists have left detectable clues—the significance of which, however, is generally not understood until after an attack. The goal is to empower analysts with tools to detect and understand these clues long before an attack is scheduled to occur, so appropriate measures can be taken by decision- and policymakers to preempt such attacks. 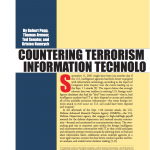 Popp, R., T. Armour, T. Senator and K. Numrych, “Countering Terrorism through Information Technology,” Communications of the ACM, vol. 47, no. 3, pp. 36–43, Mar 2004.